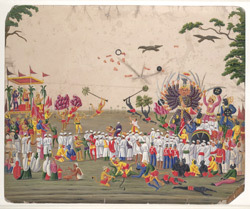 Goache painting on mica of the Ramlila spectacle by a Patna or Benares artist working in the Benares style, c. 1835-1840. This painting shows Laksmana attacking a gigantic Ravana, with monkeys and bears fighting the other demons. Rama and the monkey and bear chiefs are directing operations before a large audience of men, including a group of Bengal Army sepoys. The dramatic action has spilled over into the crowd, as if the latter was witness to the actual battle. Varanasi (Benares), founded in the sixth century BC, is situated on the west bank of the Ganges river and is one of the seven sacred cities of Hinduism. The area is known as a tirtha, or ‘crossing place’ which allows the devotee access to the divine and where gods and goddesses can come down to earth.